Crews work alongside the Trinity River during an earlier restoration project. River enthusiasts are asking TRRP to take a break from these projects on the main stem Trinity River and focus on tributaries. A meeting put on last week by Trinity River Restoration Program staff to share details and get input on two proposed projects took a detour as people in the audience asked that the program take a break from working in the river and turn its efforts to watersheds that feed it. Project designers working on the Lower Junction City and Bucktail projects shared maps and answered questions about the plans. 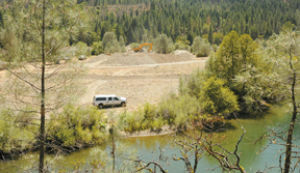 They include in-river work to increase salmon and steelhead habitat by creating slow-water refuge areas and work to allow the river to spread onto its floodplain. The work at Bucktail would include a side channel and placement of habitat features including logjams. The restoration program is more than halfway through a series of such projects meant to mitigate the downstream effects of the Trinity and Lewiston Dams. However, the projects have raised concerns of fishing guides, landowners along the river and others who say the work has gone beyond what was called for in the Trinity River Record of Decision signed in 2000. “The environmental document for these projects is inadequate,” said Tom Stokely, water policy coordinator for the California Water Impact Network and former natural resources planner for Trinity County. Stokely listed impacts from past projects — among them, he said, favorite fishing holes have been filled with gravel, landowners have lost riverbanks, constructed side channels have caused navigational problems for drift boaters and noxious weeds have been spread. Stokely said he’s been a supporter of the restoration program for many years and worked with the program as a county planner, but his confidence has been shaken and he’s not sure the benefits are worth the cost. “I’m asking you not to approve these projects for 2014 and instead spend the money on watershed restoration as envisioned in the Trinity ROD,” he said. About 50 people attended the meeting, and many shared Stokely’s views. Regarding statements that holes adult fish use have been filled with spawning gravel from the program, physical scientist David Gaeuman noted that sonar was used in a study to see if that was happening. “The fact is very few holes on the river have filled substantially,” he said. Proponents of more focus on the watersheds have said work can include fine sediment reduction, fish passage projects, water conservation, screening of diversions and tributary habitat creation. Restoration program staff said they aren’t opposed to working in the watersheds, but they aren’t the decision makers and projects must be approved by the Trinity Management Council. The program’s executive director, Robin Schrock, said for the first time the program did get an increase in watershed funding. The Trinity Management Council approved $657,082 for watershed projects for 2014 (contingent on matching funds) up from $500,000 in 2013. Bandrowski said based on a solicitor’s opinion the program is not allowed to do work in the watersheds beyond sediment management. Stokely, who is on the Trinity Adaptive Management Working Group of stakeholders that advises the Trinity Management Council, said there are conflicts of interest within the council which thwart these efforts. Although restoration program staff had not planned to distribute a draft report by an independent Science Advisory Board on the first phase of restoration projects, copies of the draft report showed up at the meeting. Members of the Science Advisory Board verbally shared their preliminary findings in January, but their report is still not finalized. Those calling for a change in the program’s direction cited the estimate from the draft report that from 2001 to 2010 rearing habitat for fish at base flows increased only by 1.2 to 1.6 percent a year. A program objective is to increase rearing habitat over a 40-mile stretch of the river by a minimum of 400 percent. “At this rate, it’s about a 385-year program,” Stokely said. Schrock noted that the analysis by the Science Advisory Board only looked at habitat during the river’s base flow of 300 cubic feet per second released from Lewiston Dam. Program staff urged the audience to note in the draft report that more recent projects such as those at Lowden Ranch and Lower Steiner Flat showed large increases in rearing habitat.
? Develop a decisions support system to evaluate projects in relation to the Trinity ROD and stakeholder objectives. That is the primary recommendation, and a main component of the system would be a fish production model to assess alternatives.
? Phase 2 projects should continue to use perennial side channels and gravel placements, as these produced the largest amount of rearing habitat at a wider range of flows than other design elements at Phase 1 sites.
? Better articulate program and stakeholder objectives and explicitly identify the relations among objectives.
? Adopt rigorous hypothesis testing for program activities and scientific investigations. Jim Smith of Douglas City suggested that it would make sense to use the program’s funding to work on the modeling called for by the Science Advisory Board and stop the in-stream work. “To not do anything really isn’t acceptable,” Bandrowski said, pointing out that the recommendations don’t say to stop doing projects. Restoration program staff said recommendations from the Science Advisory Board are already being incorporated into their project designs. In an interview after the meeting Schrock noted that members of the Science Advisory Board were not at the meeting to talk about the draft report and it is “unfortunate” someone went against that board’s wishes and distributed the draft document before it was reviewed and finalized. There were some comments and questions specific to the Bucktail project pending near Lewiston and the Lower Junction City project. The proposed projects are partly on private land but that work will not be done without the landowner’s formal permission, he said. Fishing guide Liam Gogan expressed concerns that gravel to be placed at the Junction City site will wash into a hole there. Gaeuman responded that the relatively small amount of gravel, about 3,000 cubic yards, is to be part of a structure that is not meant to move. By comparison, he said in a high water year as much as 12,000 cubic yards of gravel washes past naturally. A draft environmental assessment and initial study for the two projects is available for review on the restoration program’s Web site atwww.trrp.net. The next construction period is to go from June 2014 through December 2014, with the channel work period July 15 through Sept. 15. Proposed for construction in 2014 are the Lower Junction City project discussed at the meeting and the second part of the Douglas City project, upstream from the Highway 299, which was not done this year for funding reasons. Potential work for 2015 includes the Bucktail project discussed at the meeting and projects labeled Dutch Creek, Hatchery Reach and Lime Kiln that will be shared in future meetings.